London Man and Van > How to > General > Property Damage – How to Avoid It When Moving Home? Moving is a stressful event, there’s no doubt about that. However, things can always get even more complicated if you don’t plan every step carefully. For example, there is always the fear of damaging your belongings, like furniture, delicate items or floors and other parts of the house. Luckily, there are simple ways to avoid property damage and have a stress-free relocation by taking precautionary measures. Here are some of them. Moving home doesn’t have to be an unpleasant experience you just wish to end. It should be a happy occasion and something to look forward to. Get organised, avoid property damage and save yourself a lot of nerves. When moving house on your own or with the help of the most trusted man and van in Tooting SW17, for example, you should take your time and don’t rush. People get lost among all those boxes, lose track of time and don’t know where to start or continue. What they should do instead is to take one step at a time and know each and every step that needs to be taken. This is the golden rule when it comes to packing fragile items, for example. Once you break those plates that are of high value to you, there is no turning back. Also, you shouldn’t move on to the next task if you haven’t finished the previous one. Don’t start packing the bedroom if you haven’t finished your kitchen, and so on. One room at a time. Even though this might seem obvious, but it is worth pointing out. You should first empty all cabinets, drawers and other before you start packing, moving and loading. Empty furniture is lighter and easier to handle, not to mention safer. This move will help you avoid one of the most common moving mistakes. Moving is a complicated and exhausting job. 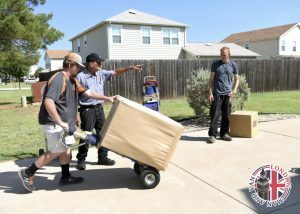 This is why it is recommended to contact professionals to give you a hand with your domestic or commercial removal. Hire the most reputable and experienced office removals in London and keep your items safe from any damages. Professional movers will ensure you a safe packing, transportation and unpacking of all of your belongings.